Have you ever wanted to learn to fly? Look no further. 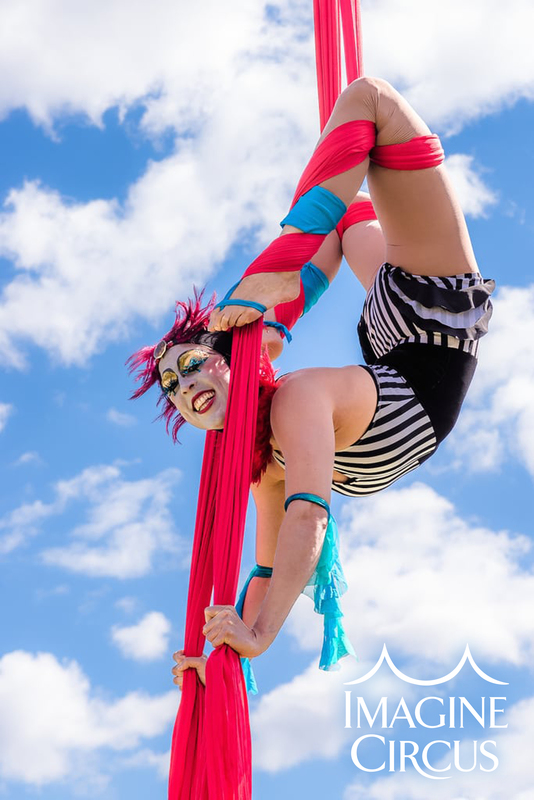 Liz Bliss is truly a Jill of all trades, from circus and aerial arts, to acrobatics, stilt walking, and fire dancing. Liz was drawn to Carrboro, North Carolina for a graduate program and after obtaining her degree, she switched gears to pursue a career path she was more passionate about. 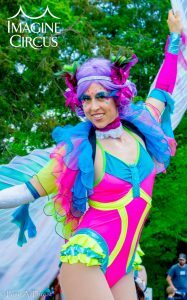 She now lives in Pittsboro, North Carolina and most recently co-founded her own production & entertainment booking company called Imagine Circus. Read more about her path to success. Liz was drawn to Carrboro, North Carolina for a graduate program and after obtaining her degree, she switched gears to pursue a career path she was more passionate about. 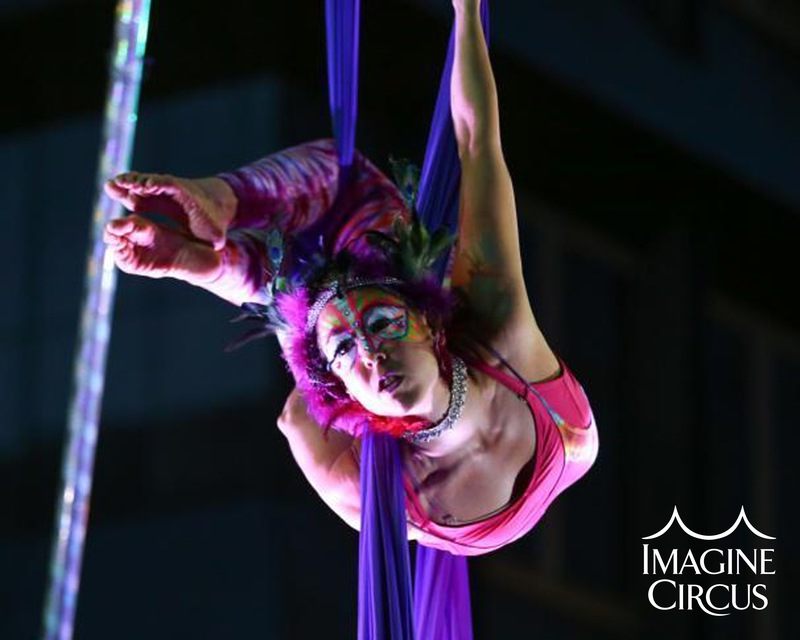 She now lives in Pittsboro, North Carolina and most recently co-founded her own production & entertainment booking company called Imagine Circus. Read more about her path to success. Imagine Circus is a booking and production company based in Raleigh, North Carolina that provides performances and shows featuring cirque-style entertainment, aerial dancers, acrobatics, fire performers, flow arts, theatrics, dance, music, costuming, makeup, and creative props and apparatuses. 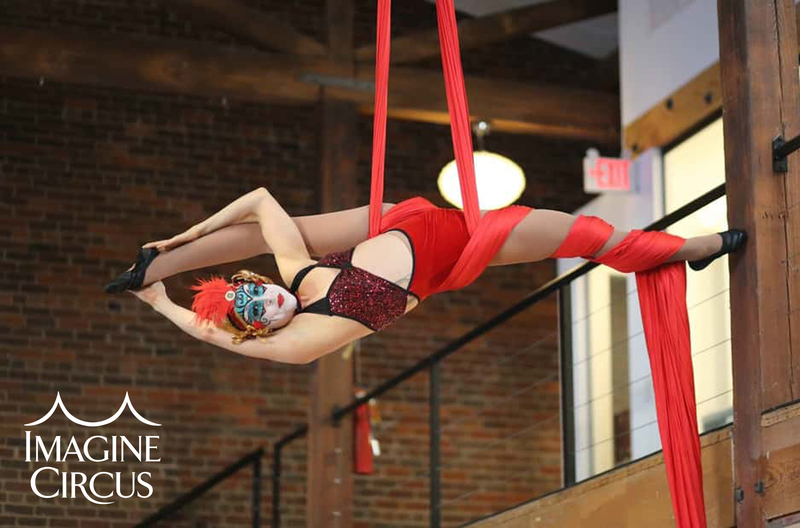 Offering customized stage shows from three to ninety minutes, Imagine Circus actively works with companies and event planners across the east coast. LDT: What path led you to North Carolina? LB: Grad School brought me down here; I have my Masters in Public Health from UNC-CH. There’s this idea that after you go to undergrad, you then go to grad school and that’s how you further your career. You check the boxes. UNC has one of the best programs for what I wanted to do then. I applied, got accepted, got funded and then I got there and realized it wasn’t what I wanted to do. After graduating and working for a couple years, I got to that point where life is more than checking the boxes so I derailed, stopped the train and got off. LB: I have been performing and producing on a smaller scale for a long time and had the opportunity to work with a lot of different production companies. Some of whom were fabulous and some were not; I learned a lot about what I did and didn’t want to be a part of. 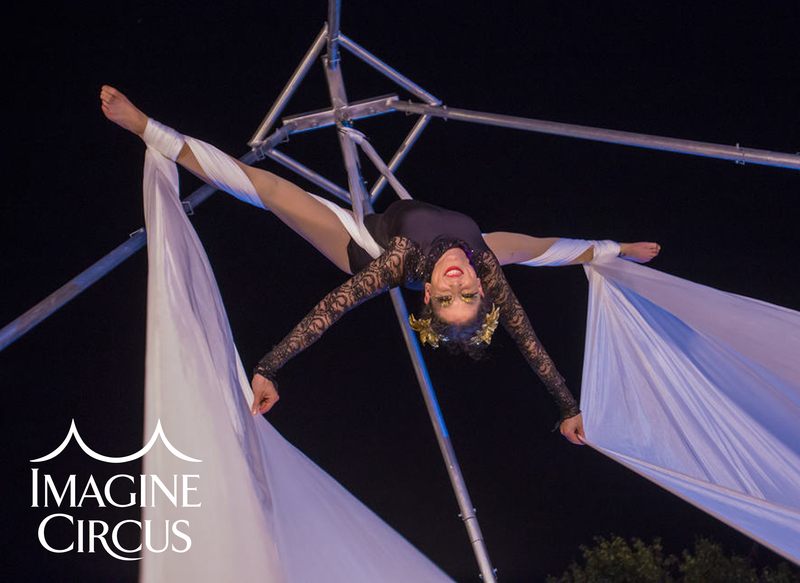 Starting Imagine Circus with two of my long-time performance partners was the logical next step to creatively explore cirque and circus arts. It has allowed me to take more control over my own experience, ensure the safety of myself and others and create a platform to guide other performers. LDT: What kind of work do you do? What is a typical day in your life? LB: There are no typical days. Every day is totally different. In addition to performing and producing, I also teach circus arts so today is a teaching day. After I leave with you, I will go teach a private lesson and then four classes. This morning I had a two-hour virtual meeting with one of my co-owners and spent a little time with my personal practice. So that was today. Saturday will be nothing like that. We have a gig, so it will be three hours in the car to perform: set up for an hour, perform, break it all down and drive three hours back. LB: The amount of time in the car is the thorn for me personally. Sometimes I’m in the car for ten hours to perform for forty-five minutes. For me, the rose is when people see what we do and they feel inspired to move or do something that’s going to have a healthy impact on their life. Make them say, “I can do that. I want to do that.” Maybe take that next step to take a circus class or stop smoking cigarettes. Go to the gym. Pick up a juggling ball. Get inspired to stop consuming and start creating. LB: That this is something that I’m stepping into with two women that I greatly respect and admire as people and artists. 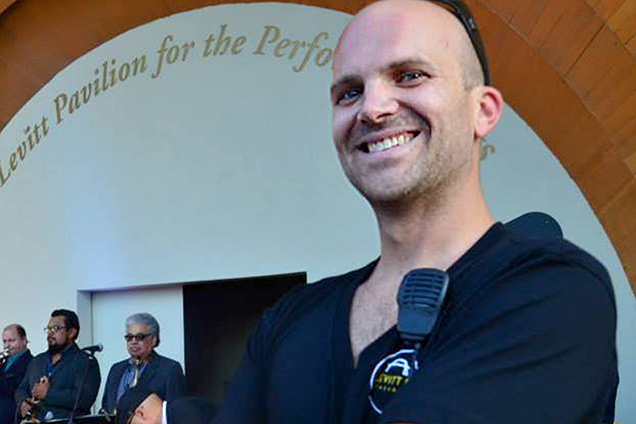 That we’re starting a company that is founded on transparency and integrity and true genuine care for our performers. I am proud of that. LB: Oh my gosh, we work with everyone! Our target audience is anyone who wants to be entertained. So we have very high-end black tie gala-type events with corporate clients and then we have backyard birthday parties with five-year-olds. We do festivals and street fairs. We also do weddings. So it’s everyone. LB: Outside of circus, definitely working with plants. Whether it’s gardening or wild harvesting and then processing them. Whether it’s making food, or tinctures or balms. Maybe another two decades from now that will be my next career path, who knows. Or maybe it will be a therapeutic experience that I do in my free time. 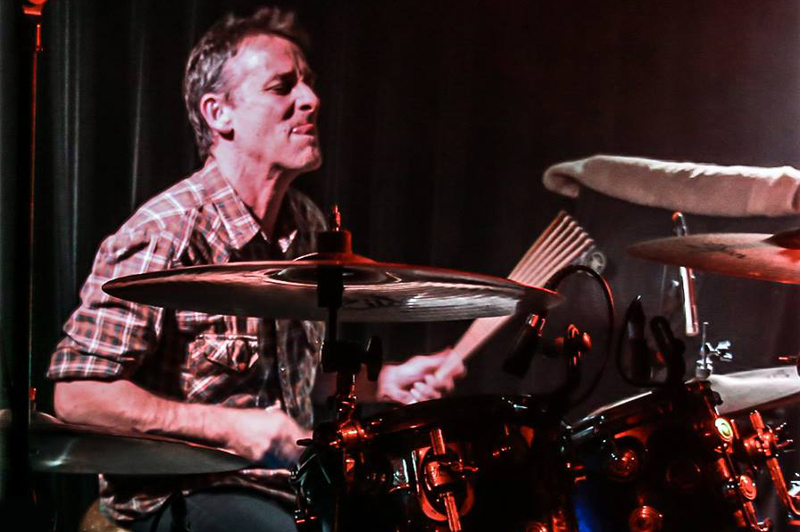 LB: Laughs… I think because the nature of so much of what I do is really fun and is very physical, there are certain things that other people need in their life that are already a party of my job. So because of that I definitely work more, but it feels balanced. And I definitely rely on the support of Garth, my husband, a lot to maintain that balance – him handling details I might not have time for in a week because I’m performing and traveling a lot. LB: Gosh, well I feel like I’m just now doing what I’m doing next. Eventually, I’d like to write another show. In 2015, I finished writing and produced and toured my first circus show, Light Pours In. Since then, I’ve been working on the music and narration for the next show – it’s a work in progress. That’s my passion project. That’s the art. Not that this other stuff isn’t art, but it’s driven with an awareness of business and financial sustainability, whereas the other projects are art and finances don’t factor into them. But that will be a couple year, work in progress. The last show took about three years from starting to write it until it’s first showing so I anticipate this next will take that amount of time. 2018 is the goal. We’ll see. LB: I’d love to connect with more event planners. Whether it’s corporate event planners, hotel event planners or folks who are doing that as a personal business. 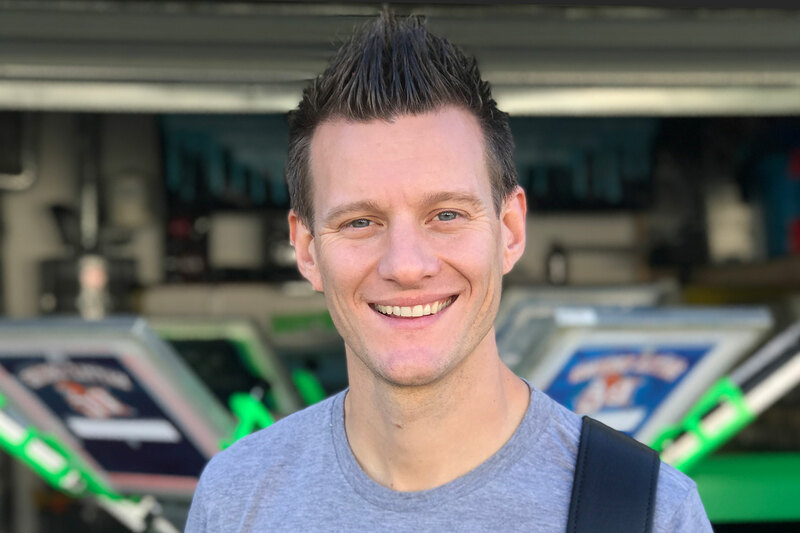 I’d love to connect with more circus-style performers, who are at a professional and committed level regardless of what skills they have so we can expand our offerings. Artists in general. People who are creative and going to inspire me. People who love plants and animals and are passionate about life. LDT: How do you think your market is going to change in the next 5 years? 10 years? LB: I think we will expand more and more into larger scale production and higher end galas. We’ll still continue working with the festivals and community events and individuals that we have relationships with. But as we build our capacity, that’s what we’re gearing towards. LB: I’d like to have more time for rehearsals. I have several different performance partners and I’m lucky if I get to see them once a week for two to three hours. There’s only so many hours in a week and only so much capacity in the body for these really extreme movements.  LDT: Who or what types of people would you like to read an interview from on Let’s Do This? LB: I want to read an interview from a raw vegan chef who has started their own company and is successful, financially stable and happy. LB: I guess it’s not directly related to work, but I write music with Garth [my husband]. I write the words for the music. I spend a lot of time in the garden watching things grow. I won’t say growing things, because they are growing, and I’m just watching them. Learning about plants either by reading about them or just observing and listening to them. And probably ingesting them to see what it feels like. Spending time outside, for my soul development. LB: People who like to move. People who want to leave the world better than they found it. People who like to eat really good vegan food. I’m not a vegan, but I love people who are really into that. People who are happy. Animals. Other people’s children. 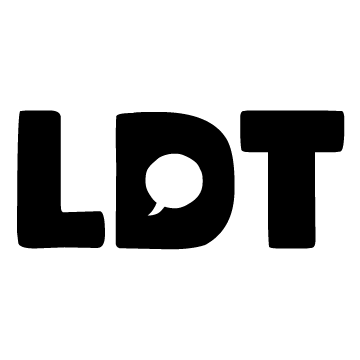 Each interview on Let’s Do This features guest questions from previous collaborators. 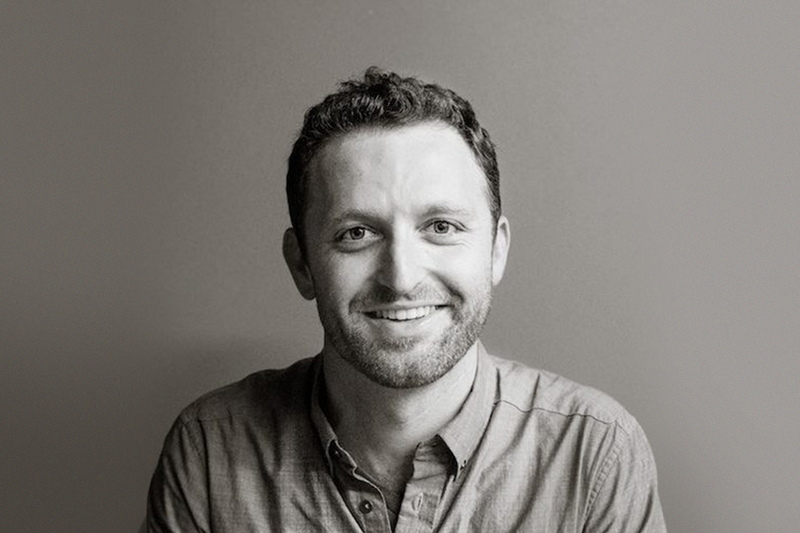 These questions come from Jasper Adams & Nic Goodman, Co-Founders of NineBar Creative. NineBar Creative is a one-stop shop for graphic, web, and spatial design in Asheville, NC. Jasper & Nic are a two-man team with background and experience with web & graphic design, pre-press & print production, architecture, photography, and coffee consumption. Jasper Adams: What did you want to do when you were fifteen and why didn’t you do it? LB: Be a lawyer. Laughs. And I realized part way through my undergrad, I would have a miserable life if that was the path I chose. I wouldn’t be engaging enough with the creative people that I wanted to surround myself with if I chose that lifestyle. Nic Goodman: How do you take your coffee? And why? What does your coffee order say about you? LB: I don’t drink coffee… laughs. What does it say about me? I’m pretty health conscious I guess. I love it. I do love it, I just don’t drink it. LB: If you had all of your financial needs already met, would you still continue on the path you are on? 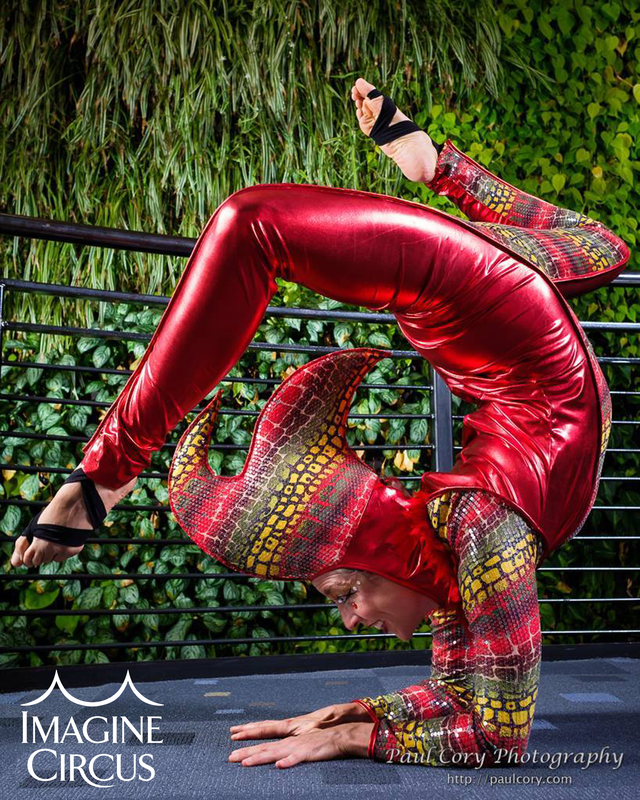 If you’re interested in a future collaboration or learning more about Liz Bliss and Imagine Circus, you can connect and follow their journey using the links below.